Zipf's law (/zɪf/) is an empirical law formulated using mathematical statistics that refers to the fact that many types of data studied in the physical and social sciences can be approximated with a Zipfian distribution, one of a family of related discrete power law probability distributions. Zipf distribution is related to the zeta distribution, but is not identical. For example, Zipf's law states that given some corpus of natural language utterances, the frequency of any word is inversely proportional to its rank in the frequency table. Thus the most frequent word will occur approximately twice as often as the second most frequent word, three times as often as the third most frequent word, etc. : the rank-frequency distribution is an inverse relation. For example, in the Brown Corpus of American English text, the word the is the most frequently occurring word, and by itself accounts for nearly 7% of all word occurrences (69,971 out of slightly over 1 million). True to Zipf's Law, the second-place word of accounts for slightly over 3.5% of words (36,411 occurrences), followed by and (28,852). Only 135 vocabulary items are needed to account for half the Brown Corpus. The law is named after the American linguist George Kingsley Zipf (1902–1950), who popularized it and sought to explain it (Zipf 1935, 1949), though he did not claim to have originated it. The French stenographer Jean-Baptiste Estoup (1868–1950) appears to have noticed the regularity before Zipf. [not verified in body] It was also noted in 1913 by German physicist Felix Auerbach (1856–1933). the size of the largest settlement. Zipf's law is most easily observed by plotting the data on a log-log graph, with the axes being log (rank order) and log (frequency). For example, the word "the" (as described above) would appear at x = log(1), y = log(69971). It is also possible to plot reciprocal rank against frequency or reciprocal frequency or interword interval against rank. The data conform to Zipf's law to the extent that the plot is linear. It has been claimed that this representation of Zipf's law is more suitable for statistical testing, and in this way it has been analyzed in more than 30,000 English texts. The goodness-of-fit tests yield that only about 15% of the texts are statistically compatible with this form of Zipf's law. Slight variations in the definition of Zipf's law can increase this percentage up to close to 50%. In the example of the frequency of words in the English language, N is the number of words in the English language and, if we use the classic version of Zipf's law, the exponent s is 1. f(k; s,N) will then be the fraction of the time the kth most common word occurs. The simplest case of Zipf's law is a "1⁄f function." Given a set of Zipfian distributed frequencies, sorted from most common to least common, the second most common frequency will occur ½ as often as the first. The third most common frequency will occur ⅓ as often as the first. The fourth most common frequency will occur ¼ as often as the first. The nth most common frequency will occur 1⁄n as often as the first. However, this cannot hold exactly, because items must occur an integer number of times; there cannot be 2.5 occurrences of a word. Nevertheless, over fairly wide ranges, and to a fairly good approximation, many natural phenomena obey Zipf's law. where ζ is Riemann's zeta function. Although Zipf’s Law holds for all languages, even non-natural ones like Esperanto, the reason is still not well understood. However, it may be partially explained by the statistical analysis of randomly generated texts. Wentian Li has shown that in a document in which each character has been chosen randomly from a uniform distribution of all letters (plus a space character), the "words" with different lengths follow the macro-trend of the Zipf's law (the more probable words are the shortest with equal probability). Vitold Belevitch in a paper, On the Statistical Laws of Linguistic Distribution offered a mathematical derivation. He took a large class of well-behaved statistical distributions (not only the normal distribution) and expressed them in terms of rank. He then expanded each expression into a Taylor series. In every case Belevitch obtained the remarkable result that a first-order truncation of the series resulted in Zipf's law. Further, a second-order truncation of the Taylor series resulted in Mandelbrot's law. Similarly, preferential attachment (intuitively, "the rich get richer" or "success breeds success") that results in the Yule–Simon distribution has been shown to fit word frequency versus rank in language and population versus city rank better than Zipf's law. It was originally derived to explain population versus rank in species by Yule, and applied to cities by Simon. A plot of word frequency in Wikipedia (November 27, 2006). The plot is in log-log coordinates. x is rank of a word in the frequency table; y is the total number of the word’s occurrences. Most popular words are "the", "of" and "and", as expected. Zipf's law corresponds to the middle linear portion of the curve, roughly following the green (1/x) line, while the early part is closer to the magenta (1/x0.5) line while the later part is closer to the cyan (1/(k + x)2.0) line. These lines correspond to three distinct parameterizations of the Zipf–Mandelbrot distribution, overall a broken power law with three segments: a head, middle, and tail. Zipf's law in fact refers more generally to frequency distributions of "rank data," in which the relative frequency of the nth-ranked item is given by the Zeta distribution, 1/(nsζ(s)), where the parameter s > 1 indexes the members of this family of probability distributions. Indeed, Zipf's law is sometimes synonymous with "zeta distribution," since probability distributions are sometimes called "laws". This distribution is sometimes called the Zipfian distribution. The "constant" is the reciprocal of the Hurwitz zeta function evaluated at s. In practice, as easily observable in distribution plots for large corpora, the observed distribution can be modelled more accurately as a sum of separate distributions for different subsets or subtypes of words that follow different parameterizations of the Zipf–Mandelbrot distribution, in particular the closed class of functional words exhibit s lower than 1, while open-ended vocabulary growth with document size and corpus size require s greater than 1 for convergence of the Generalized Harmonic Series. The Zipf distribution is sometimes called the discrete Pareto distribution because it is analogous to the continuous Pareto distribution in the same way that the discrete uniform distribution is analogous to the continuous uniform distribution. 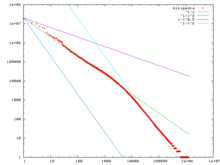 It has been argued that Benford's law is a special bounded case of Zipf's law, with the connection between these two laws being explained by their both originating from scale invariant functional relations from statistical physics and critical phenomena. The ratios of probabilities in Benford's law are not constant. 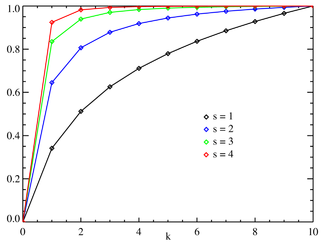 The leading digits of data satisfying Zipf's law with s = 1 satisfy Benford's law. rule for a general probability distribution is the base of Asymmetric Numeral Systems family of entropy coding methods used in data compression, which state distribution is also governed by Zipf law. Zipf's law also has been used for extraction of parallel fragments of texts out of comparable corpora. Pareto principle, a.k.a. the "80–20 rule"
^ Fagan, Stephen; Gençay, Ramazan (2010), "An introduction to textual econometrics", in Ullah, Aman; Giles, David E. A. (eds. ), Handbook of Empirical Economics and Finance, CRC Press, pp. 133–153, ISBN 9781420070361 . P. 139: "For example, in the Brown Corpus, consisting of over one million words, half of the word volume consists of repeated uses of only 135 words." ^ a b c Powers, David M W (1998). "Applications and explanations of Zipf's law". Association for Computational Linguistics: 151–160. ^ Moreno-Sánchez, I; Font-Clos, F; Corral, A (2016). "Large-Scale Analysis of Zipf's Law in English Texts". PLoS ONE. 11: e0147073. arXiv:1509.04486. doi:10.1371/journal.pone.0147073. ^ Bill Manaris; Luca Pellicoro; George Pothering; Harland Hodges (13 February 2006). INVESTIGATING ESPERANTO’S STATISTICAL PROPORTIONS RELATIVE TO OTHER LANGUAGES USING NEURAL NETWORKS AND ZIPF’S LAW (PDF). Artificial Intelligence and Applications. Innsbruck, Austria. pp. 102–108. Archived (PDF) from the original on 5 March 2016. ^ Wentian Li (1992). "Random Texts Exhibit Zipf's-Law-Like Word Frequency Distribution". IEEE Transactions on Information Theory. 38 (6): 1842–1845. CiteSeerX 10.1.1.164.8422. doi:10.1109/18.165464. ^ Neumann, Peter G. "Statistical metalinguistics and Zipf/Pareto/Mandelbrot", SRI International Computer Science Laboratory, accessed and archived 29 May 2011. ^ Belevitch V (18 December 1959). "On the statistical laws of linguistic distributions". Annales de la Société Scientifique de Bruxelles. I. 73: 310–326. ^ Zipf GK (1949). Human Behavior and the Principle of Least Effort. Cambridge, Massachusetts: Addison-Wesley. p. 1. ^ Ramon Ferrer i Cancho & Ricard V. Sole (2003). "Least effort and the origins of scaling in human language". Proceedings of the National Academy of Sciences of the United States of America. 100 (3): 788–791. doi:10.1073/pnas.0335980100. PMC 298679. PMID 12540826. Archived from the original on 2011-12-01. ^ Lin, Ruokuang; Ma, Qianli D. Y.; Bian, Chunhua (2014). "Scaling laws in human speech, decreasing emergence of new words and a generalized model". arXiv:1412.4846 [cs.CL]. ^ Vitanov, Nikolay K.; Ausloos, Marcel; Bian, Chunhua (2015). "Test of two hypotheses explaining the size of populations in a system of cities". Journal of Applied Statistics. 42 (12): 2686–2693. arXiv:1506.08535. doi:10.1080/02664763.2015.1047744. ^ N. L. Johnson; S. Kotz & A. W. Kemp (1992). Univariate Discrete Distributions (second ed.). New York: John Wiley & Sons, Inc. ISBN 978-0-471-54897-3. , p. 466. ^ a b Johan Gerard van der Galien (2003-11-08). "Factorial randomness: the Laws of Benford and Zipf with respect to the first digit distribution of the factor sequence from the natural numbers". Archived from the original on 2007-03-05. Retrieved 8 July 2016. ^ Ali Eftekhari (2006) Fractal geometry of texts. Journal of Quantitative Linguistic 13(2-3): 177–193. ^ L. Pietronero, E. Tosatti, V. Tosatti, A. Vespignani (2001) Explaining the uneven distribution of numbers in nature: The laws of Benford and Zipf. Physica A 293: 297–304. ^ Mohammadi, Mehdi (2016). "Parallel Document Identification using Zipf's Law" (PDF). Proceedings of the Ninth Workshop on Building and Using Comparable Corpora. LREC 2016. Portorož, Slovenia. pp. 21–25, . Archived (PDF) from the original on 2018-03-23. George K. Zipf (1949) Human Behavior and the Principle of Least Effort. Addison-Wesley. "Online text "
George K. Zipf (1935) The Psychobiology of Language. Houghton-Mifflin. Alexander Gelbukh and Grigori Sidorov (2001) "Zipf and Heaps Laws’ Coefficients Depend on Language". Proc. CICLing-2001, Conference on Intelligent Text Processing and Computational Linguistics, February 18–24, 2001, Mexico City. Lecture Notes in Computer Science N 2004, ISSN 0302-9743, ISBN 3-540-41687-0, Springer-Verlag: 332–335. Damián H. Zanette (2006) "Zipf's law and the creation of musical context," Musicae Scientiae 10: 3–18. Frans J. Van Droogenbroeck (2016) "Handling the Zipf distribution in computerized authorship attribution"
Gabaix, Xavier (August 1999). "Zipf's Law for Cities: An Explanation" (PDF). Quarterly Journal of Economics. 114 (3): 739–67. CiteSeerX 10.1.1.180.4097. doi:10.1162/003355399556133. ISSN 0033-5533.
International Conference on Bioinformatics Computational Biology: 2011. Shyklo A. (2017); Simple Explanation of Zipf's Mystery via New Rank-Share Distribution, Derived from Combinatorics of the Ranking Process, Available at SSRN: https://ssrn.com/abstract=2918642. Wikimedia Commons has media related to Zipf's law. Benford’s law, Zipf’s law, and the Pareto distribution by Terence Tao.